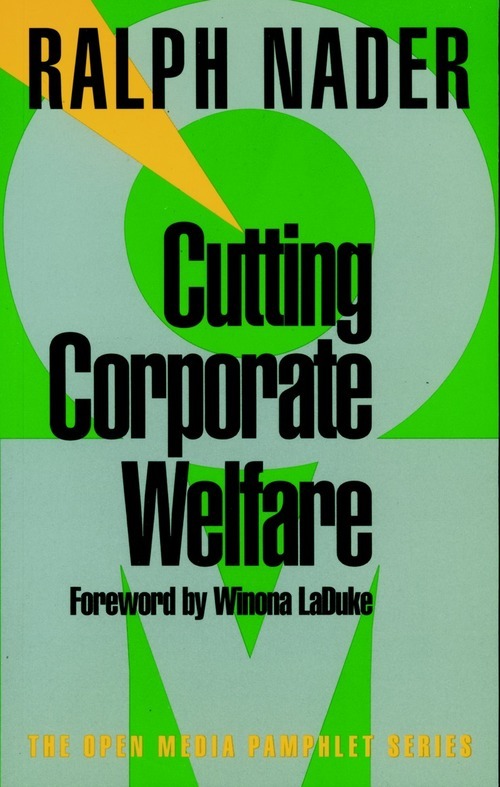 In this groundbreaking pamphlet, based on testimony he delivered before Congress, Ralph Nader describes how corporations are picking our pockets, and what we can do to stop them. While the United States continues to experience unprecedented cuts in social service programs and millions of Americans go without health insurance, massive corporations continue to reap huge sums of taxpayer money through "corporate welfare"--corporate subsidies, bailouts, giveaways, and tax escapes. Cutting Corporate Welfare details numerous appalling examples of corporate welfare, including: the giveaway of the public airwaves, which by definition belong to the people, to private radio and television stations (including the latest $70 billion gift of the digital spectrum); taxpayer subsidies for giant defense corporation mergers and commercial weapons exports to governments overseas; and the practice of making patients pay twice for drugs--first, as taxpayers subsidize the drugs' development, and again, as patients, after the federal government gives monopolistic control over the chemical's manufacture to a price-gouging drug company. Cutting Corporate Welfare sounds a wake-up call for those concerned about how we are being pick-pocketed by big business, and what we can do to stop it. 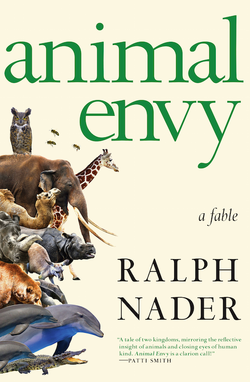 It's Ralph Nader's birthday today! 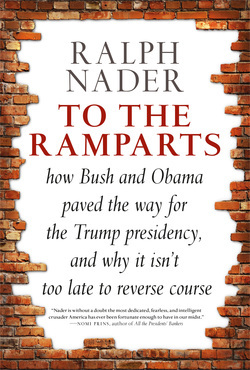 To celebrate, we're publishing an exclusive exerpt from his new book, To the Ramparts: How Bush and Obama Paved the Way for the Trump Presidency, and Why It Isn't Too Late to Repair the Damage, due in August. To the Ramparts is a rousing call for action to combat the Trump presidency, but it's also a clearheaded account of how Democratics and Republicans alike helped to get us into our current muddle. The chapter below outlines how the Obama administration punted on the question of raising the national minimum wage, and addresses how future generations of progressives should tackle the issue. Happy Birthday, Ralph! Foremost among these demands [outlined in the previous chapter] is that the Democrats get on the stick about boosting the minimum wage. A telling anecdote will make clear both my advocacy for this long-overdue initiative and the sad ripple effect the Democrats’ inaction has had. This was hardly a valid excuse on his part, but it does underline how Democrats’ lack of enthusiasm for increasing the minimum wage has played the pivotal role of a damper here, drawing down the fire of others (in unions and grassroots advocacy groups) who might have gotten into the fight more heavily if they saw the Democrats on the hustings. Of course, it was not Obama alone who defaulted here; though Trumka may have pointed to him—it was the whole Democratic Party that was blameworthy. Riding in on a progressive wave, the Democrats seemed primed to boost the wage minimum wage after Obama’s election. The minimum wage did rise in 2009, but this was no thanks to the people in power—it was part of a previous graduated increase that had started in 2007, led by the late senator Ted Kennedy. Since that time no movement has been seen, although Obama had eight years to fight for it. Talking to Democrats should serve as a reminder of why the wage needs to be raised and what a no-brainer it is to fight for this increase for anyone who wants to pick up a landslide victory over Republicans. 1. A wage increase represents pure fairness for millions of hard-pressed American workers and their families. Over 70 percent of Americans in national polls (which includes conservative voters) support a minimum wage that keeps up with inflation. 2. There has been a drumbeat of local politicians embracing a wage increase. In 2012 eighteen states raised minimum wages, to $11.00 an hour—to reach $13.50 by 2020. 3. Since at least 1968, businesses and their executives have been raising prices and their salaries (note: Walmart’s CEO makes over $11,000 an hour, plus lavish benefits! ), but they have not increased the wages of their increasingly more productive—and profitable—workers, whose federal minimum wage is lower in purchasing power than it was fifty years ago. 4. The tens of billions of dollars that an $11.00 minimum will provide to consumers’ buying power will create more sales and more jobs. Aren’t economists always saying the most important way out of the recession and the investment stall is to increase consumer spending? 5. Most independent studies collected by the Economic Policy Institute show no overall decrease in employment due to a minimum wage increase. Most studies show that job numbers overall go up. The landmark study rebutting claims of lost jobs was conducted by professors David Card and Alan Krueger in 1994. 6. Many organizations with millions of members are on the record as favoring an inflation-adjusted increase in the federal minimum wage. They include the AFL–CIO and member unions, the NAACP and La Raza, and hundreds of nonprofit social service and religious organizations. They need to move from being on the record to being on the ramparts. 7. With some Republicans supporting a higher minimum wage, even under Trump, a push in Congress would split the iron unity of the Republicans. This issue may also encourage Trump voters to vote for Democrats. A Republican worker in McDonald’s or Walmart or a cleaning company still wants a living wage to support his or her family. Looking back, calls by grassroots organizations and others for a raise in the minimum wage during the Obama years left Democrats unmoved. However, to his credit, Rep. Jesse Jackson Jr. (D-IL) in June 2012 did introduce the “Catching Up to 1968 Act of 2012” (H.R. 5901)—legislation to raise the federal minimum wage to $10.00 per hour. When Jackson introduced the measure, the minimum wage was $7.25, way below the unrealistically low federal poverty definition of $18,123 per year for a family of three. Adjusted for inflation, the 1968 minimum wage today would be about $11.00 per hour. Together with Rep. John Conyers (D-MI), Rep. Dennis Kucinich (D-OH), and Robert Weissman, president of Public Citizen, at that time I was pleased to be with Rep. Jackson at a news conference to explain this long-overdue necessity for millions of hard-pressed, working Americans of all political persuasions. The purpose of the minimum wage, first enacted in 1938 under President Franklin Roosevelt, was to provide a minimally livable salary. This implied at least keeping up with inflation, if not with new living expenses not yet envisioned seventy-five years ago. While businesses like Walmart and McDonald’s have been raising their prices and executive compensation since 1968, these companies have received a windfall from a diminishing real minimum wage paid to their workers. Since the minimum wage has not been raised, these arguments are still totally valid today. The economics behind the Jackson bill are strongly supportive of moral and equitable arguments. Most economists agree that what our ailing economy needs is more consumer demand for goods and services, which will create jobs. Tens of billions of dollars flowing from a higher minimum wage will be spent by poor families and workers almost immediately. But the bill was defeated, another nail in the Democrats’ trapdoor. If Trump is to be defeated, the Democrats have to get out of bed with the fat cats. While these big-bucks characters are upping their pay every year, they often seem to be more circus proprietors than businesspeople because they pay their workers so little. This whole debate over the minimum wage also casts a spotlight on the big corporate bosses who pay themselves $11,000 to $20,000 per hour and the harm such avarice causes their own companies’ workers and shareholders, as Steven Clifford has so brilliantly documented in his new book, The CEO Pay Machine. If the Democrats want intellectual heft to rebut the carping, craven objections of the corporatist think tanks and trade associations (headed by bosses making big-time pay themselves), they cannot do better than to refer to the work done by the Economic Policy Institute in Washington, DC. A 2012 report by the respected National Employment Law Project titled “Big Business, Corporate Profits, and the Minimum Wage” said that “the majority (66 percent) of low-wage workers are not employed by small businesses, but rather by large corporations with over 100 employees.” The fifty largest employers of low-wage workers are mostly “in strong financial positions.” And note this finding by NELP: “The top executive compensation averaged $9.4 million [in 2011] at these firms.” This means that the bosses, before taking a lunch on January 2, made more money than a minimum wage worker makes in a year. Talk about the corrosive effects of inequality: the top 1 percent took 93 percent of the nation’s income growth in 2010, according to Holly Sklar of Business for a Fair Minimum Wage. Those in the corporate oligarchy who oppose a higher minimum wage have no moral standing whatsoever. Many of the nation’s corporate giants pay no income tax or very little, far less than a cab driver. Between 2008 and 2013, GE’s effective tax rate was 9 percent, despite earning over $34 billion. It is hard for companies making record profits, paying executives record pay, and spending billions of dollars on stock buybacks to enhance their own compensation packages to have any credibility on this subject. The Democrats should have enacted legislation for a higher minimum wage during Obama’s eight years. Instead, startling as this may seem to readers wearing rosy spectacles, Obama kept “progressively” lowering his estimate of the dollar amount needed for an eventual minimum wage boost. Wait a minute. In 2008, Obama campaigned to have a $9.50 per hour minimum wage by 2011. In 2013, he said he would settle for $9.00 by 2015! Going backward into the future. Apparently, it didn’t matter to Obama that at that time the US had the lowest minimum wage of any major Western country (Australia’s was nearly $15.00, France’s was over $13.00, and the Canadian province of Ontario’s was $10.25—all of these countries also have health insurance for all). It didn’t matter, as I mentioned, that two-thirds of low-wage workers in our country work for large corporations such as Walmart and McDonald’s, whose top CEOs make an average of $10 million a year plus benefits. Nor did it matter that corporations like Walmart have had to pay workers much more in places like Western Europe than in the United States (where these companies got their start), and that they’ve still made good profits where the minimum wage is higher. Haven’t you noticed how few workers there are now in the “big box” chain stores compared to years ago? Well, one Walmart worker today does the work of two Walmart workers in 1968. That is called a doubling of worker productivity. Yet many of today’s Walmart workers, earning less than $10.50 an hour, are making significantly less than their counterparts made in 1968. My collaborators and I got out on the picket lines around the time of Obama’s insufficient minimum wage proposal, and we demonstrated at shopping malls where Walmart had established giant stores. We noted that one million Walmart workers were making far less, in inflation-adjusted dollars, than what Walmart workers made in 1968. In 1968 Walmart was run by its founder, the legendary Sam Walton, who started with one store in Rogers, Arkansas. Sam had to pay his workers wages that were worth much more than wages today because the law required him to do so. The clenched-jaw opposition to raising the minimum wage continues, led by a punishing US Chamber of Commerce and a consortium of CEOs. Low wages paid by stores that service poorer people eventually translate into less money spent in those stores, since the consumers are strapped. Internal emails leaked from Walmart in 2013 indicated the company’s awareness of this vicious circle, and executives expressed concern about the spending level of the low- to middle-income shoppers the company depends upon most. “Where are all the customers? And where’s their money?” bewailed Cameron Geiger, a Walmart senior vice president. What Walmart’s bosses themselves are coming to realize is that raising their workers’ wages to $10.00 per hour would lift the income of millions of workers, who in turn would spend some of that extra cash at Walmart stores. A few years ago, feeling the heat from environmentalists, high-level Walmart managers visited the late Ray Anderson, the pioneering CEO of Interface Corporation in Atlanta, the largest carpet tile manufacturer in the country. Mr. Anderson was the corporate leader in taking recycling and reduction in pollution to unsurpassed levels, while regularly cutting costs. Doing well by doing good! The cutting costs part attracted their attention. These managers are now among the executives running Walmart, and the changes they have made—reducing excessive packaging materials, saving on water and energy, and increasing recycling—have brought Walmart lower costs and public praise. Yet when it comes to their workers—euphemistically called “associates”—Walmart bosses can’t seem to absorb the evidence that paying them $12.00 to $15.00 an hour would reduce the company’s notoriously high worker turnover and improve productivity and morale. At the store level all over the US, Walmarts are full of surveillance cameras, monitoring not just the customers but also the stores’ workers. Walmart security guards are stiffer than Army MPs. They are programmed to be the private police, keeping away peaceful demonstrators in so-called private shopping malls that were built on tax preferences and abatements. More than seventy-five years later, there are 3.3 million Americans working for pay at or below the federal minimum wage. More extensively, 30 million low-wage workers are making less today, adjusted for inflation, than they did forty-five years ago in 1968. They are working for a wage that does not even reach the federal poverty line for a family of three, and they cannot afford basic necessities like food, housing, transportation, and healthcare. Each year that the federal minimum wage is not increased, you and Congress are effectively telling low-wage workers that they are not worth as much as they were the year before, and each dollar they earn gets stretched even further due to the effects of inflation. Here’s where you can make a decisive executive decision. Under your watch, federally contracted low-wage workers walked off the job and participated in some of the largest strikes the nation’s capital has seen in recent years. Despite the fact that they worked on contract for the federal government, they were still being paid poverty wages—some even explained that they were being paid less than the federal minimum wage, which invites your administration’s immediate investigation! This is disgraceful; the federal government should be providing a shining example of fair and just treatment of their contracted workers for other employers to follow. According to a recently released report from Demos, a public policy organization, the federal government indirectly employs the largest number of low-wage workers in the country. More even than Walmart and McDonald’s combined. The Washington Post reported in June 2013 that a study from the National Employment Law Project (NELP) surveyed a sample of 567 federally contracted jobs. Seventy-four percent of federal contract workers surveyed earned less than $10.00 per hour, 58 percent had no employment benefits, and 20 percent depended upon some form of public assistance. In the absence of any serious movement in this disconnected Congress to increase the minimum wage, you have the potential to exert significant influence on the wages paid to millions of low-wage workers in this country. With a simple executive order, you can fix this shameful deprivation. I urge you to sign an executive order mandating that federal contract workers be paid no less than $10.70 per hour (the inflation-adjusted equivalent to 1968’s minimum wage). Is this too much to ask of you? This is, of course, no substitute for a lasting federal minimum wage increase. But an executive order provides you with an option to avoid the morass in Congress and effect real positive change in millions of low-wage workers’ lives and to effect that change now. I hope that you will recognize and seize this opportunity. This small but important example will make it easier for you to push Congress for a greater and bolder minimum wage increase than you did in your State of the Union address. On the anniversary of the federal minimum wage, you should sign an executive order raising the minimum wage of those working for the federal government through corporate contractors. It is the federal government’s—and your—responsibility to set the example for the rest of the country to follow. When Franklin Delano Roosevelt signed the Fair Labor Standards Act into law, he showed courage in the face of the Great Depression as well as considerable opposition and criticism from businesses. Is it not time for you to leave your mark, to show Americans what type of president you want to be remembered as, and to be a leader on this issue? Millions of workers throughout the country deserve a minimum wage that, at least, catches up with that of 1968. I’m sending a copy of this letter to Michelle Obama, who is said to have your ear. That letter might give you the erroneous impression that Obama was the only Democrat heel-dragging on this issue. Since Obama is out of office, let’s turn to the highest Democrat in the House at this very moment, Rep. Nancy Pelosi (D-CA), the House Minority Leader. This Pelosi mailing, uninspiring and defensive, is another product of the party’s political consultants, who have failed them again and again in winnable House and Senate races against the worst Republican Party in history. These consultants, as former Clinton special assistant Bill Curry notes, make more money from their corporate clients than from political retainers. Slick, arrogant, and ever reassuring, these firms are riddled with conflicts of interest and might just as well be Trojan horses. The point here is more far-reaching than it may seem. Not only do the Democrats personally ignore the burning issue of the minimum wage today, but they have also set up an infrastructure that blocks their own access to vital information. By relying on consultants, they lock themselves into a corporate-dominated echo chamber where the cries of the people go unheard. As you may know, Obama did eventually sign an executive order advancing the minimum wage to $10.10 an hour, but this only applied to federal contract workers. This was a step in the right direction and one place where he passed on a positive signal to the future—if not, going by Trump, the immediate future. So, a livable minimum wage remains agenda item number one for a remade Democratic Party. Born in Connecticut in 1934, RALPH NADER has spent his lifetime challenging corporations and government agencies to be more accountable to the public. His 1965 book Unsafe at Any Speed permanently altered the course of a reckless U.S. automobile industry and made Nader a household name. His lobbying and writing on the food industry helped to ensure that the food we buy is required to pass strict guidelines before reaching the consumer. One of Nader’s greatest achievements was his successful lobbying for a 1974 amendment to the Freedom of Information Act, which gave increased public access to government documents. Over the years he has co-founded the public interest groups Public Citizen, Critical Mass, Commercial Alert, and the Center for the Study of Responsive Law. His 2000 presidential campaign on the Green Party ticket served to broaden the scope of debate on the nation’s priorities. 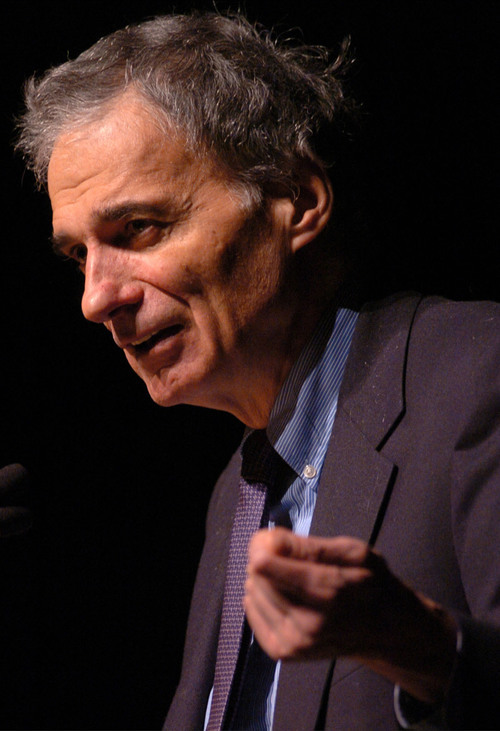 Named by the Atlantic as one of the hundred most influential figures in American history, Nader continues to be a relentless advocate for grassroots activism and democratic change. He lives in Washington, D.C.
by Project Censored, Mickey Huff, et al. by Ralph Nader, Michelle Sforza, et al.